Home » Unique » A Short Story About "PASTA"
A Short Story About "PASTA"
Pasta is a processed food that comes from Italy. Pasta dough made ​​from a mixture of flour, water, eggs and salt. From this dough, pasta shaped into many arts. Pasta can be said so on 'his rice' Italians and has become an important part of their lives. Today, a lot of good restaurants serving Italian and non-paste as one of the main menu. Pasta comes from the Italian 'pasta alimentare' which means the dough foodstuffs. In broad terms, 'pasta' can mean all the dough like bread dough, pastry, or cake. In Italian, 'pasta' is called pastasciutta. Pasta made ​​from semolina flour mill that is the result of durum wheat grain is mixed eggs so that little bright yellow, and when cooked properly will result in slightly chewy texture. American-made pasta are often made ​​from a mixture of flour and semolina flour Farina, so it has a softer texture suitable to be used like a casserole dish. Outside the country of origin in Italy, pasta is usually sold in packages in dried form. Dried pasta made ​​in factories using extrusion machine that pushes out pasta dough through the strainer holes. The forms of the other pasta obtained by grinding the pasta dough into sheets and then cut into pieces or printed. Home-made fresh pasta and a restaurant set up by hand a few moments before the pasta boiled. Fresh pasta requires a shorter cooking time, but not durable because its water level is kept high. Meanwhile, dry pasta can hold stored up to three years or more because the water content is low, around 10 percent. There are also pasta are cooked and heated with a microwave oven stayed often found in supermarket frozen food section. Foods like pasta are often found in various places in the world since ancient times, especially in areas with a population that makes wheat and cereals as a main meal. Wheat that has been milled often cooked as porridge or mashed into flour and made ​​bread. Pasta is the most likely alternative to porridge or bread, because pasta is a preserved food made ​​without the need to be cooked. In Europe, the oldest written record of noodles similar food found in the Etruscan tomb decorations in Central Italy from 400 BC. In China, noodles has been known since 2000 BC based on the results of excavations at the site Lajia (western China) which is situated on the banks of the Yellow River. Under a thick layer of soil at excavation sites that have been damaged by earthquakes and floods found yellow noodles in a clay pot upside down. Long noodles are about half a meter with a diameter of 3 millimeters. This result shows noodles made ​​from millet seed flour. 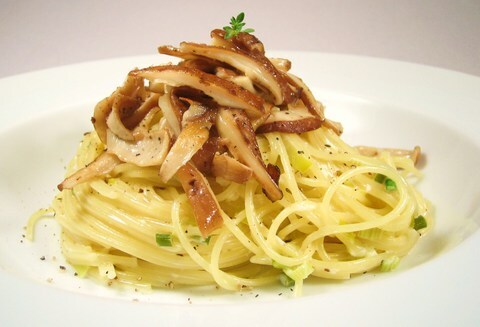 Pasta made ​​up of various shapes and sizes. In Italy there are more than 650 types of pasta and almost every year created a new form. Long-shaped pasta called spaghetti like noodles, thinner variation called vermicelli, while a longer variation and flat (like Shahe) called linguine. Version is thicker than linguine fettucine. Name the type of pasta is usually taken on the basis of its name in Italian. Short-shaped pasta called penne (pen), while the butterfly-shaped pasta called farfalle. Related Posts : A Short Story About "PASTA"